For the second time we asked participants at the IMISCOE annual conference to give us feedback on the organization and content of the conference. The average score out of ten for the conference in Prague as a whole was 8.4. We consider this as a very good score. Read more about the outcome of the survey. Prof.dr. Sawitri Saharso and Dr. Peter Scholten - the Editors in Chief of the journal Comparative Migration Studies - welcome applications from colleagues who wish to become a member of the journal's editorial board (call for editors, pdf). Comparative Migration Studies (CMS) is an international peer-reviewed journal that publishes comparative research from various disciplines. Applications should be sent to info@comparativemigrationstudies.org no later than December 1st 2016. Comparative Migration Studies (CMS) is an international, peer-reviewed journal for comparative research in the field of migration, integration and ethnic studies. CMS is published by Springer. The association between IMISCOE and Comparative Migration Studies means that the journal can publish Open Access without asking for Author-Pays Fees. The deadline for submission of book proposals under this call is 15 November 2016. “Boundaries of belonging: nation, kinship and identity among migrants and minorities”. FINAL CONFERENCE DIVERCITIES PROJECT (rEGISTRATION CLOSES 1 DECEMBER 2016). CONFERENCE: WELCOMING REFUGEES – LOCAL EUROPEAN EXPERIENCES (January 25th – January 27th 2017). CALL FOR APPLICATIONS: MACIMIDE JUNIOR VISITING FELLOWS, 2016 – 2017. Deadline: 31 October, 2016. 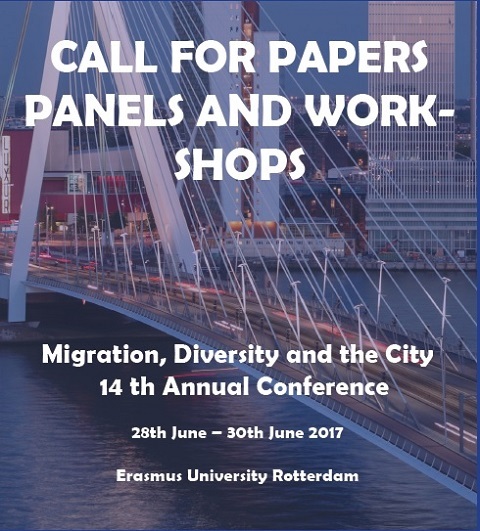 CALL FOR PAPERS: WORKSHOP ON CITIZENSHIP, MIGRATION AND DEVELOPMENT. Deadline: 15 November, 2016. CALL FOR PAPER PRESENTATIONS ON HIGHLY SKILLED MIGRANTS AND BRAIN WASTE. Deadline: 1 December, 2016. INDUSTRIAL RELATIONS IN EUROPE: BETWEEN CORE AND PERIPHERIES (CFP). Deadline: 31 March, 2017.